It´s time to get into shape. I have begun the part of my trip that I have been looking forward to most: Hiking in the hills. There are many foot powered journeys in Colombia, some can be done in one day while others are long, guided affairs. 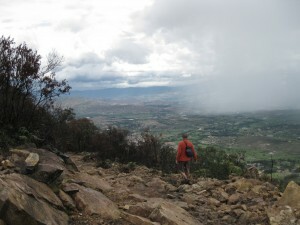 I plan to tackle all of the one-dayers that I can, and that begins here in Villa De Leyva. This place is quiet and scenic. The cobblestone square is very cool and the streets are safe to walk at night. More of a getaway for Colombian tourists to shop and spend the weekend. I love the way the orangish street lights illuminate the stones in the road, as you will see in the picture below. My first jaunt took just less than an hour to summit and rewarded me with some nice city views and a white Jesus statue. A good conditioning hike. The next day I attempted a longer expedition, one which required a stop at an out of town guest house for directions. The regular trail was closed due to a recent fire, so they guided me to a nearby path up the hill. My feet were pressing down on mostly rock and clay, fairly vertical, with occasional animal land mines. No real summit to this one, the top was an entrance to a valley with scattered farms and cloud covered peaks on either side. I realized then that the path was the road for the locals into town, and on the way down I crossed paths with a woman walking her donkey back up. A little rain on the way up made the path slick for my decent, but the clouds parted and the views were bueno. After having my first set menu lunch on Tuesday, I rented an expensive bicycle to extend my range, and got to see some average things. Without studying the map close enough, I was unable to find the waterfall I was searching for. Legs got tired and I decided to turn back. I did enjoy the ability to get out of town and see some of the surrounding villages. On a trip like that, I tend to tell myself that at least I will be a stronger/better man because of it. I am now in San Gil, the “The extreme sports capital of Colombia”. The bus ride was rough and not cheap, but I was able to partake in conversation with a young Canadian man who is on a similiar journey. My accommodations are both the cheapest and most luxurious I have come upon, so I may extend my stay. 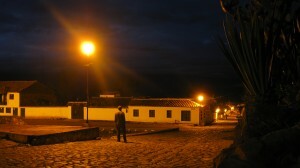 There are a few sights in town, but I plan to do a day trip tomorrow to Barichara for a local trek. As I am writing, it is absolutely pouring down rain and the street looks like a river. The same happened in the last town, but this is what I get for coming during the wet season. Makes me want to get to the Caribbean coast even sooner. A few notes and numbers at the 1 week mark: My daily spending is a little high right now, I estimate that I am currently on a $30/day pace. Partly hurt by the bad exchange rate, also the cheapest accommodations have all been over $10/night. Tonight´s hostel is down to $8 and dinner was only about $2, so those are good reasons to stick around. My goal is to be under $20/day and possibly lower if I get some farming in. At the present photo rate, I will top the 9,000 picture mark. I imagine that may go down as I linger more in places, but the beach sunsets are still on the horizon. The journey here was a little painful. 17 hours in the Atlanta airport was just a bit too much. With the long layover, they gave me my bag back, thus I had to tote it around the waiting area for 11 hours until they would take it back. I was entertained by the end of the Lakers/Thunder game but the police cruising through to raze the bums out was disturbing. I was able to find some soft chairs to relax in, but no real sleep was had. I made it into Bogota around 9pm Wednesday and the taxi was able to find my hostel. The only problem I have with me casa is the locks. My keychain has 4 keys on it: 1 for the room, 2 for the front door which need to be used in combination with your foot to open, and 1 for the padlocked door inbetween the entrance and my room. Other than that, the room is big, nice, and quiet. After sleeping most of Thursday away, I made it to the Plaza de Bolivar and surrounding attractions. 3 empanadas for dinner and a quick, unlucky stop at one of the small casinos. Friday: took the lift up to Monserrate peak with great views of the city below and a church. 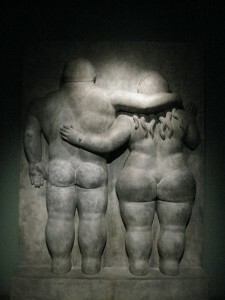 I came down and checked out the Museo Botero and it´s interesting collection of art based on people and things of the inflated variety. While wandering around, I discovered a ceremony of some sort, complete with marching band, military drills, and flag folding. I was entertained and at it´s conclusion I walked down a main street which was now occupied by performers, hawkers, and carni types. Most of you know how I feel about carnis, so no need to say that I walked at a brisk pace. So far so good. I am starting to get back into the rythum of travel and feel more comfortable every hour. Only issues so far, the lack of English spoken and the complexity of the prices. The exchange rate is currently 1,840 = US$1. So when I ask them “How much (cuanto)?” I get a reply in the thousands, which is tougher to understand. I´ll get it but it will take some time. I just hand them a wad of bills and trust that they are giving me back what they should. 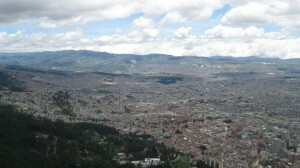 On Tuesday, April 20th, I begin a series of airborne travels which will eventually place me in Bogota, Colombia. As the title suggests, my return is set for the middle of the 11th month of this year. My length of stay was influenced by a few factors: A desire to have time to linger, Availability of dates to redeem my airline miles, KU basketball, The Masters, and Thanksgiving. Thus, I am left with just under 7 months to make my way around the intriguing continent known as South America. There is not really much of a plan this time. I have a vague idea of where I want to go and what I want to see, but it’s possible that none of it may happen. WWOOFing is part of the plan, but as yet I have not received confirmation from any farms. With this extend stay, I will have the ability to participate in any volunteer opportunities that present themselves. The journey begins with Colombian goals of hiking near or on mountains and spending time on Caribbean beaches. I could see myself hanging out there for a month or two, before continuing the journey south through Ecuador. I will hug the western coast of Peru, then set my sights on the vast highlands of Bolivia. From there, a time and money based decision will be made: Shall I cut through northern Argentina en-route to Uruguay or will the pull of Patagonia be too strong? At that point I will just have to make it back to Bogota in time to catch my flight home on November 11th.